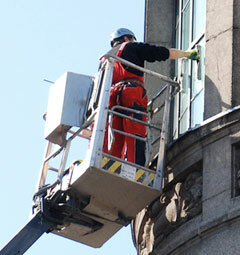 High access cleaning can be one of the biggest challenges for window cleaning companies. We have years of experience in maintaining high access buildings and the challenges they present. There are several methods which can be used to clean tall buildings, the new commercial pole systems can now clean up to an amazing 80ft. However, for the taller or trickier buildings or when a close up clean is required Clean Assured have a range of access platforms which can be set up quickly and efficiently and can tackle those confined spaces as well without trouble. Sometimes you just need high access for inspections, surveys or insurance purposes. We can provide suitable access platforms and specialist camera and recording equipment for your use.